In 2019, Bugatti has unveiled this new, limited edition Chiron Sport "110 ans Bugatti". 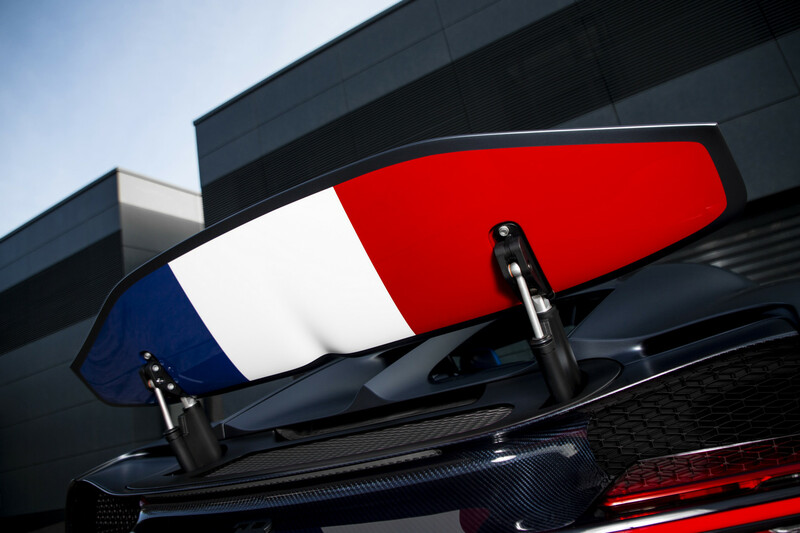 It's essentially a Chiron Sport painted in "Steel Blue" with exposed carbon-fibre front and rear ends and plastered with the French tricolour. You'll also find brake calipers painted in French Racing Blue behind the matte black "Nocturne" alloy wheels, and a bespoke aluminium filler cap. Matte black is also used for the car's exterior badging, rear spoiler, and exhaust tips. Lastly, there is Sky View roof, which has two fixed glass panels above the driver and passenger and comes as standard in this limited Chiron. The sports steering wheel combines matte carbon-fibre with a blue leather cover. After both World War I and II, the Alsace region was transferred from the Germans back to the French. The "Deep Blue" leather interior also features carbon fibre on the nacelle, steering wheel, steering column and seat trims, with French Racing Blue trim on the seats, stowage compartments and seat belts. The Type 10 was light, small and nimble with an adequate power output - an agile racing auto with function following form in an uncompromising way. To emphasize on this special edition model, "110 Ans Bugatti" emblem is applied on the headrests. Shortly afterwards, he continued the development of his Type 10 to create the Type 13 - the first official Bugatti model. Up to 1956, about 7,950 vehicles of Types 10 to 252 were produced, of which an estimated 2,000 or so are still in existence. This new edition is based on the mighty Chiron Sport, offering a handling upgrade of the regular ho-hum Chiron. It's not clear how much more this will run over the $3.26 million Chiron Sport, but Bugatti will only offer 20 of these, and they're likely all spoken for. Performance figures stay the same, with the Chiron Sport's 8.0 litre quad-turbo W16 engine serving up 1,479 hp (1,500 PS) and 1,600 Nm of torque. Keep your foot on the pedal and you'll hit 400 km/h in 32.6 seconds before maxing out at 420 km/h.